There’s an order for a the preliminary design of the Northman 40 (project 140). The Northman 40 is a mix between the Beluga 40 and the Quaestor 40. We took the lines of the Beluga 40 and the bow and bulwark of the Quaestor 40. The cabin is stretched forward for an acceptable headroom in the interior. The doghouse will give the interior more daylight and headroom. 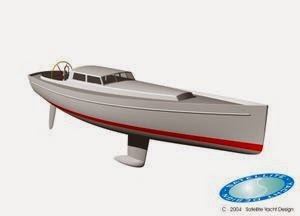 The Northman will be constructed in aluminium.